CUESA’s Volunteer of the Month program recognizes the dedication and work of some of our most active volunteers. CUESA relies on volunteers to help with education programs, special events, public outreach, and other activities that help fulfill our mission to cultivate a sustainable food system. Learn more about volunteering and sign up here. It is sometimes confusing to figure out whether your packaging belongs in the recycle or compost bins at the Ferry Plaza Farmers Market. Jeremy Dutra, our November Volunteer of the Month, is here to help! Market shoppers may recognize his smiling face from the many Waste Wise stations set up around the market. 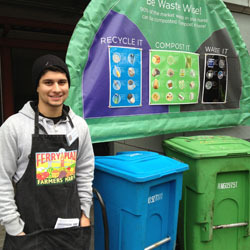 As a regular Waste Wise volunteer, Jeremy helps monitor the bins and educate customers about proper waste sorting. “Jeremy is so enthusiastic about his role at the market,” says Education and Volunteer Programs Coordinator Michelle Venetucci Harvey. “We always need more help with this program, and Jeremy has been so dedicated in making it more accessible to customers.” Read more about CUESA’s Waste Wise initiative here. CUESA: What do you do when you aren’t volunteering for CUESA? Jeremy: When I am not volunteering at CUESA, I am a full-time college student at California State University, East Bay. I’m a senior Environmental Studies and Geography major and will hopefully graduate in the spring! Outside of school, I like being outdoors and going hiking and kayaking, and have been passionate about photography since high school. CUESA: Where does your interest in food come from? Jeremy: My interest in food really took off when I became a vegetarian two years ago and felt I needed to be more creative with my food choices. I started incorporating vegetables and tofu more frequently into my diet, along with using a variety of grain products like quinoa and bulgur. I started appreciating the flavors of the food I ate more and wanted to continue researching recipes with new tastes and textures. I didn’t want to live the rest of my life on processed “veggie” burgers. CUESA: What made you want to volunteer for CUESA? Jeremy: I wanted to gain some experience working with a nonprofit with a goal I completely support. I love food and am a strong supporter of sustainability, so CUESA seemed just right. I knew I made the right decision after attending the volunteer orientation and listening to CUESA’s mission of furthering sustainable agriculture through the operations of the farmers market and education programs. CUESA: Do you have any interesting stories from your time as a CUESA volunteer? Jeremy: I definitely have some interesting stories to say the least. It’s common to see people digging plastic and glass bottles out of the recycling and tourists taking pictures of the Waste Wise stations. One of the more most interesting stories was when I was not fast enough to prevent a market customer from throwing their food scraps in the trash, and when I told him he should’ve thrown it in the compost, he threw his arms, shook his head, and rolled his eyes. Thankfully, I get enough market customers appreciating my time and what I do to cancel out one rude one. CUESA: What’s your favorite thing to make in the kitchen? Jeremy: It’s cliché for a vegetarian, but I like making a marinated tofu stir fry with bell peppers, mushrooms, spinach, leeks, and zucchini with quinoa cooked in a savory vegetable broth. It does not take long to make and is so tasty and healthy. I sometimes add feta to give it a salty taste and shredded carrots and toasted almonds for crunch. CUESA: Do you have any seasonal market tips for our shoppers? Jeremy: I’m still new to eating seasonally, so I don’t have a specific tip for shoppers, but I would in general recommend it to people! I think one’s eating habits should coincide with what is actually going on in nature. It will allow you to not only eat more sustainably, but learn to appreciate the food more and what you can do with it because it’s not always available like at grocery stores. You won’t feel disconnected from the natural world when you eat seasonally.